CORNED BEEF HASH AND ME | Jane Lear. Writing on Food and Travel. Saint Paddy’s Day is around the corner, and supermarket meat cases are brimming with vacuum-packed slabs of salty, rich corned beef. In a day or so, I expect Sam will be bringing one home, like he always does. I like corned beef, I really do. Sam goes the extra mile to find a brisket that’s minimally processed, so it’s not quite so pink with nitrites, and his pressure-cooker technique yields tender, satiny meat you can pull apart with your fingers. I’m in charge of the potatoes and cabbage, and often we manage to work a few slices of good brown bread and Irish butter into the meal. It is hearty, honest food—perfect for March, when the wind can cut right through you, even on a fine day. The problem is the damned leftovers. I’m fond of a thick, squelchy corned beef sandwich, made with Orwashers seeded rye and spicy brown mustard, with a half-sour or garlic pickle on the side. But one will do me for a while; as far as deli is concerned, I’m more of a pastrami kind of gal. 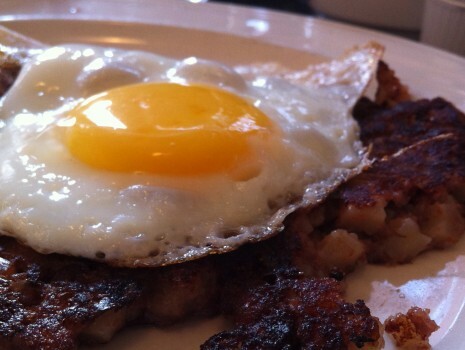 As for hash—reason alone to buy a corned beef for many people—I understand the appeal when expertly made from the remains of a classic New England boiled dinner. But in my experience, homemade versions are never cut into small enough dice; they’re composed of disparate chunks of meat and cabbage-flavored potatoes (or worse, cabbage and potatoes) that don’t ever seem to coalesce into a harmonious whole when cooked. Which is why I prefer my hash out of a can. I know, I know, this is a travesty of tradition, but it reminds me of camping weekends when I was a child, and, later on, cobbling together fast, inexpensive meals on sailboats. These days, there is generally a small stash hidden high up in the pantry cabinet for emergency rations. On a night, for instance, when Sam is out of town (he can’t stand the stuff), I have a story to file, and good lord, it’s 9:30 at night and I’m practically fainting with hunger. Relax, I never eat the whole thing. And I don’t find myself indulging all that often, maybe once or twice a year. It’s just nice to know it’s there if I need it, and it’s not like it’ll go bad. Crowned with two eggs fried sunny side up and until the edges frizzle, this is also my default breakfast at a diner or coffee shop, after I’ve sized up the guy manning the flat top. He has to treat that dollop out of the can with a little respect: That means not leaving it in a mound to steam until warmed through (revolting), but spreading it out with a spatula so it develops a crisp, reddish brown crust and, along the way, kisses up to a little bacon grease. Green tea, my usual morning brew, does not taste at all right with this. 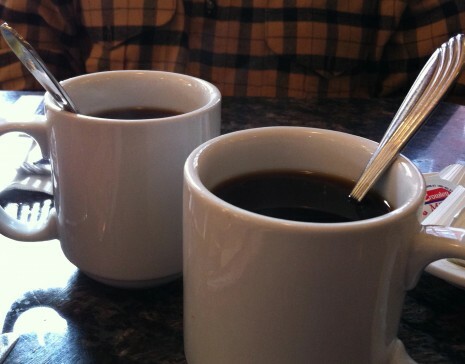 Instead, I want hot coffee, and lots of it. Bliss. Posted: March 12th, 2013 under food, pantry, restaurants. Followed you over from takepart.com via a food inc article on FB. I love this article. 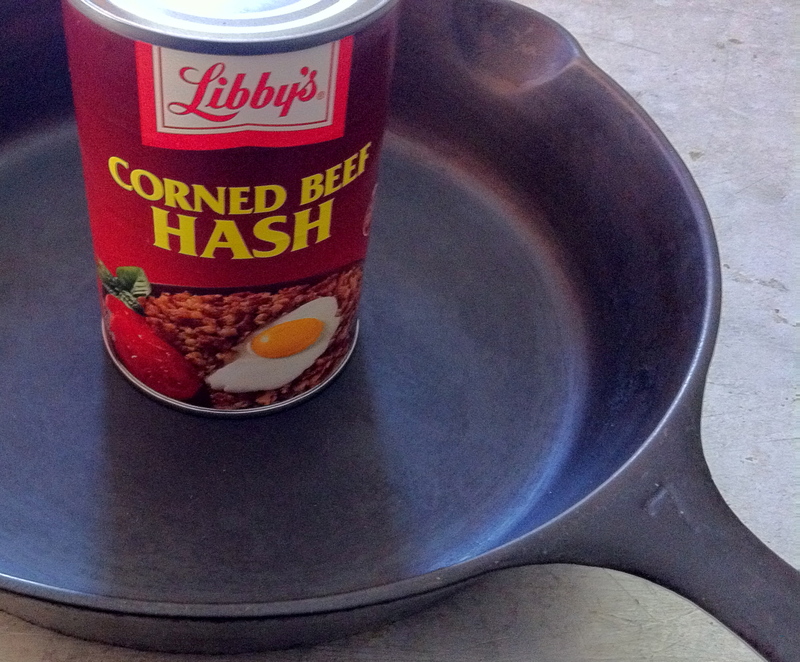 Canned CB hash with a couple of fried eggs (curly edges) and black coffee is a childhood memory. I’m in Costa Rica at the moment and a couple of weeks ago I tried to describe it to some folks. I’ve been dying for some ever since. It was my last breakfast when I left the states and will be among the first when I get back. I totally agree that you have to spread it out and get it all crusty. Like you, it’s a once or twice a year thing. I’m enjoying your site. I have your article on leeks (one of my faves) all queued up.